Ball valves that can be opened and closed manually are pretty well known to everyone. 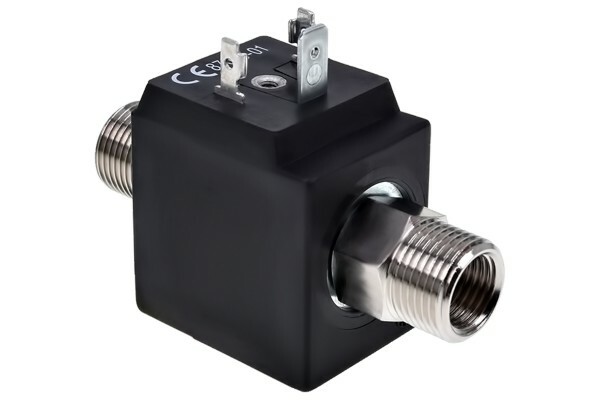 With this product, you get an electrically controlled valve. When the connection receives power through the 4-pin molex connector, the lock opens magnetically. When the power is switched off, the magnets close the valve automatically. The magnetic closure serves to ensure security for your water circulation. If, for example, you use external radiators, you can attach the valve in front of the bulkhead fittings on the case in order to prevent water running out in case the external hoses or radiator are damaged. The same goes for transporting water cooled systems with external elements. But this valve can be used outside of PC systems as well. For example, take a small filling station. Here the amount of water can be electronically controlled by timing the closure. It can also be used as a safety lock in machines, for example as an emergency shutoff in the event of power failure. Guter Tag, was das Gewinde im Ventil: G1/4“ männlich (wie im Bild) oder G1/4“ Innen (wie in der Beschreibung)? Das Innengewinde ist ein G1/4", man kann also normale Anschlüsse verwenden. Das Außengewinde ist ein 3/8" Gewinde. Beide Seiten haben die selben Gewindearten.